All about the best team in the land and all the world Manchester City!!! : Slyvinho signs!!!! 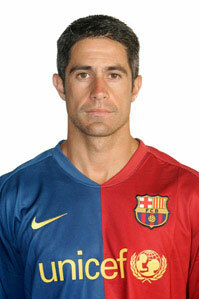 City have announced the signing of former Arsenal and Barcelona left back Sylvinho. The player joins on a free transfer and has signed a one year deal. Sylvinho is getting on a bit at 35 but he will be a good back up player to Wayne Bridge, in fact he might even displace Bridge! Sylvinho has a good pedigree and if called upon I am sure he will do a job for us. Sylvinho will be welcomed at City by fellow Brazilian Robinho, I am sure that Robinho having a compatriot at the club came into Hughes's head when signing Sylvinho. What do you think, should we have signed a younger left back to push Bridge? What a great start to the season for the Citizen. The only sad thing was about last Saturday's game was that they could not turn the many opputurnity they had into goals. They should have easily won the game. Overall I believe they are heading in the right direction. I was happy to see Carlos TEVEZ being named in the starting line up as I'm huge fan of Argentina. For my money, he will make a better partner with Emanuel ADEBAYOR. That was just a classy pass for Ade to score. I'm sure we will see more of that in many months to come. Perhaps, it will be nice to hear on your thoughts about Carlitos playing Manchester City. For your information, you guys too have a lot fan of our blog.